Need Help Cooking Fish and Seafood? You are sure to find your answers here. Along with delicious fish and seafood recipes, cooking tips and interesting facts about fish and seafood. "Fish and seafood is a favorite food for many people, but it is the most feared food to cook at home." You just need to know what you are buying, the proper way of cooking the fish or seafood and a great recipe. That's it. Here's just a little sample of the interesting facts you will find on this site. Did you know that shrimp get their flavor from what they eat and what they eat depends on the waters they come from? 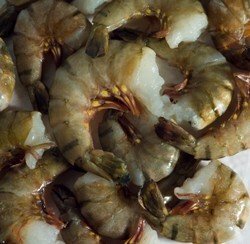 Hence, you have a mild tasting white shrimp from the Gulf coast or an idony, bolder tasting Mexican brown shrimp. So depending on if you like a mild or full flavored shrimp, you now know what kind of shrimp to buy. Find out more about shrimp with these Shrimp Facts. Trying to find out, how in the world do I cook this fish? What does this fish or seafood taste like? Can I bake it, broil it or fry it? What's some of the best seafood for omega 3 fish oil? What to look for when buying fresh and frozen seafood. You will find the answers to these questions and more in the Seafood Guide. Boatloads of fish and seafood recipes collected over the years. If by chance you can't find the information you are looking for, then just ask the fishmonger, that's me. Thanks for stopping by. 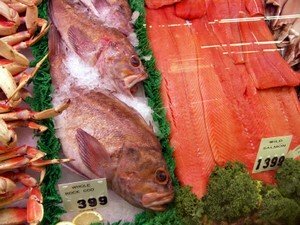 If you like the cookingfishmonger.com please tell a friend.